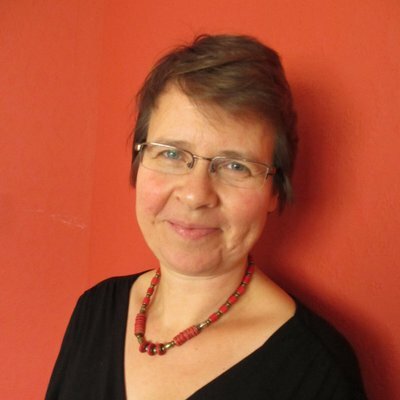 Dr Sabine Best is Head of Research, Marie Curie, the UK charity that provides care and support for people living with a terminal illness. Here, Dr Best explains the background to a longer article published in the May/June edition of the European Journal of Palliative Care. We recently completed a UK-wide project that identified the top 10 most important research topics to improve palliative and end of life care for people with a terminal illness. This 18-month consultation was a real partnership effort, with 10 organisations co-funding and a total of more than 30 organisations involved in helping with dissemination. It was led by Marie Curie, the UK charity providing care and support for people living with a terminal illness, which is also the largest charitable research funder in this area in the UK. The process involved two major surveys to identify and then prioritise research questions – more than 1,400 people with a terminal illness, current and former carers, and health and social care professionals took part. A workshop of patient and carer representatives then selected the final 10 from 28 shortlisted questions. Top of the list was identifying the best ways of providing care outside of working hours to avoid crises and help patients to stay in their place of choice. In second place was looking at how access to palliative care services can be improved for everyone regardless of where they are in the UK. Identifying the benefits of Advance Care Planning and other approaches to listening to and incorporating patients’ preferences was in third place. A total of 83 research questions, some more specific than others, are included in the final report, which was published in January 2015 . They follow distinct themes, such as Managing Symptoms and Medications, Communication, Support and Service Use, all important areas of concern for patients and carers. The project, which is called the ‘Palliative and end of life care Priority Setting Partnership’, worked with the James Lind Alliance (JLA) The aim of the JLA is to ensure that the voice of patients, carers and clinicians is heard when setting research priorities. This is important to avoid wasteful health research that has no relevance to what is important to patients and carers (Chalmers and Glaziou, 2009 and Chalmers et al, 2014). Whilst the main project is finished, we now have to determine how best to address the questions, not only the top 10 but also the whole list of 83 questions. We are looking into how much research is currently in process, which addresses those research questions, and we are considering funding research in partnership with other organisations. We are also continuing to look at the initial survey data to add a qualitative analysis, led by Dr Annmarie Nelson from Cardiff University. We are hoping that there will be many more outputs from this collaborative project. To follow the progress of the project, look at the project website, view our video film, and/or follow us on Twitter (@PeolcPSP). Palliative and end of life care Priority Setting Partnership (PeolcPSP) – Putting patients, carers and clinicians at the heart of palliative and end of life care research, January 2015. View the video film, ‘The story of the Palliative and end of life care Priority Setting Partnership’. Chalmers I and Glaziou P, Avoidable waste in the production and reporting of research evidence, Lancet 374, 86-9 (2009). 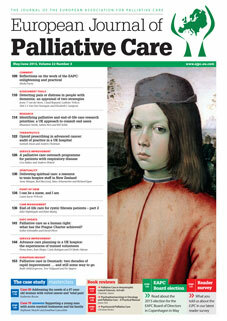 This post relates to a longer article, ‘Identifying palliative and end of life care research priorities: a UK approach to consult patients, carers and health and social care professionals, the end users of research’ by Rhiannon Smith, Sabine Best and Bill Noble published in the May/June 2015 issue of the European Journal of Palliative Care (vol. 22.3). If you have a web-based subscription to the journal you’ll be able to download this issue, plus all articles in the journal archive. You can also browse the archive and download articles by taking a 10-minute or 30-minute subscription. Members of the EAPC receive discounted subscription rates to the journal – click here to subscribe online. This entry was posted in EAPC-LINKED JOURNALS, European Journal of Palliative Care, RESEARCH and tagged Palliative and end of life care Priority Setting Partnership, Research priorities for palliative and end of life care. Bookmark the permalink.